Just saying hello. I've been a bit sick and a bit under the weather but soon, very soon, I'll let you in on the skinny. I’m going to tell you a secret. After five years of marriage and seventeen years of knowing my husband and his family, this year’s Turkey Day was the first time I felt comfortable going to my in-laws without my husband there. Yes. That’s the big secret. It may not sound like a big to-do but, I’m sure a few of you understand. The Apostolic faith has always been very present in my husband’s family. I grew up going to church on holidays and found a Baptist church home when I turned twenty-two. When visiting his family, comments were made about why I didn’t wear dresses or why I chose to get a tattoo. I always felt as if everyone was looking at me, judging me. I’m pretty sure it was just me isolating myself. At least I hope it was just me. Going to visit them without him was always a fight if he wasn’t by my side. I’d go in, have everyone’s eyeballs on me for a few minutes and then quietly leave through the back door. My presence had been felt. I had said my hellos. I ate a plate of food and took a slice of Grandma’s Famous Apple-Peach Cobbler with me. Mission accomplished. I can’t do that now. My husband and I have a daughter and everyone wants to see her. Maybe that’s what makes it less stressful. No one is looking at me anymore. They are looking at our wonderful daughter, saying she looks just like my mother and has her father’s eyes. They are watching her play with the other kids and notice how she looks taller than she did a few weeks ago. And she loves it, most of the time. For the first few minutes, she hangs around my legs looking at people as if she’s never seen them before. Then she loosens up and starts running behind chairs and snatching things off of tables or shelves accessible to her. When the other kids come around, she smiles and hugs and chases them around. And now, I’m looking at her too. Their eyes aren’t on me anymore. They’re watching my daughter grow into this wonderful person who blows kisses and gives hugs to, almost, everyone by the time we leave. Now, it doesn’t matter if I’ve been inducted into the family by way of our daughter or if they can finally tell that I am who I am. They look at our daughter, an extension of both of our families, with fascination and adoration. And I don’t mind them watching her. I love that they can see her grow and learn and play. I still get invited to church and am told how I look much prettier with my hair down and with a dress on. But most importantly, they love having our daughter visit. Today we have the talented Mimi Jean Pamfiloff and her new novella, Accidentally... Cimil? Ms. Pamfiloff has been so kind as to give us an excerpt and a crazy (crazy doesn't even begin to describe the goddess Cimil!) interview with Cimil. 1. Cimil, rumor has it that you are trying to end the world. How do you respond to these allegations? 2. Why, exactly, do you hate clowns? - Really now. Why does anyone hate clowns? They smile all the time. It’s just creepy. And wholly unnatural. Nuff said. 3. How did Minky become your pet? Where did you find her? - Ah! Now there’s an exciting story. It was about 10,000 B.C., and I was hunting packs of randy little Leprechauns (to play a prank on Fate; their tiny little hands freak her out). Anywhoodles, I came across Minky trying to steal their pot of gold (it’s invisible, just like Minky). We’ve been best buds ever since. Cimil, did you just make up that entire story? - Yes. Absolutely. Dangit! I’m such a bad liar! The truth is we met at a knitting circle. You’re not going to tell us the truth, are you? 4. Now that your darkest secrets have been revealed in your novella, Accidentally Cimil, how do you feel? And do you still plan to smite the writer? - My secret is such a humdinger, how can I not be relieved? My only concern is that my brethren will reject me when they find out. But it’s really not my fault. And yes, Mimi Jean shall be smote! So is your dark secret the reason you lied to your brethren about being clairvoyant when your true gift is speaking to the dead? 5. Can you give us a hint about how the series will end? - I could tell you, but you’d never believe me. It’s BIG! It would even shock a Leprechaun and nothing shocks those little bastards. I will tell you this, however; it involves very hungry hippopotami. Check out an excerpt from the awesome new novella. He closed the gap between us and grabbed me by the shoulders. I was about to release a surge of light into his hands simply for the sheer joy of watching him shoot across the room and slam into the wall, but then I remembered the stupid collar. I was dead in the water. “I came to tell you something,” he said. I could have sworn I saw actual sparks shoot from his eyes. Probably no one had ever told him anything other than, “Yes, my king” or “No, my king” and “Your wish is my command, my king.” Well, soon he’d be just another soul wondering why he had wasted his life on silly things like wealth and power. And why the hell he’d messed with me! He closed his eyes and took a breath, clamping down whatever bull crap he had the urge to say. When his dark eyes opened again, he tilted his head and placed his hand on my cheek. There was flicker of something almost… endearing within them. He bent his head and kissed me hard. My entire body lit up like a bonfire, and the heat from his bare chest enveloped me in a steamy wave of lust. My knees buckled, and he immediately wrapped me in his large arms, pulling me close to prevent me from sliding down to the floor where I conjectured I might end up a squishy little puddle of fluttering nerves and unflattering spasms of joy. I pushed away and slapped him. Hard. And ladies and gentleman, we have a cool link to a fantastic paranormal giveaway. Meet Cimil. Yeah, she's the Goddess of the Underworld, harbinger of all things evil and deadly, yadda, yadda . . . but she's also crazy fun! While minding her own business in Giza, Egypt, around 3000 BC (give or take a few centuries), she spots the hottest mortal her immortal eyes have ever seen. And he's not just any guy-he's the strong, powerful pharaoh who's fallen madly in love with her. But when he kills her pet unicorn, Cimil vows revenge, even if takes thousands of years to get even. When Roberto meets Cimil, the king knows she's his soul mate. It isn't just her beautiful eyes or gorgeous body, but the godly power he feels simmering just beneath her fun-loving surface. They were the perfect couple . . . until the dead unicorn thing. Now after four thousand years, Roberto crosses paths with Cimil again, and his love for her is stronger than ever. But can he prove that he can once again be trusted with her heart? Mimi Jean Pamfiloff is The New York Times and USA Today Bestselling Author of Paranormal Romance. Before taking up a permanent residence in the San Francisco Bay Area, Mimi spent time living near NYC (became a shopaholic), in Mexico City (developed a taste for very spicy food), and Arizona (now hates jumping chollas, but pines for sherbet sunsets). Her love of pre-Hispanic culture, big cities, and romance inspires her to write when she's not busy with kids, hubby, work, and life...or getting sucked into a juicy novel. As I sat making a list of resolutions for this year I realized how mundane the act really was. I found my promises to myself boring and reminiscent of every other December for the past five years. Lose thirty pounds, stop watching so much television… The boring list goes on and on. I’d much rather focus on the lessons I’ve learned and use them to push me along. Maybe that was my problem in the past; I didn’t use what I’d learned to help me accomplish new things. So I guess that is my resolution for this year and years to come: grow from what I’ve learned. 1. Stop being my biggest enemy. Picking on myself and noticing the muffin top or extra inches doesn’t help me get healthier. I look in the mirror and see all the weight I’ve gained since high school. My husband, and that creepy guy downtown and the produce market, look at me as if I were the most beautiful woman they’ve ever laid eyes on. Instead of vowing to lose all the extra weight, I’ve decided to go for a walk at least twice a week and pack my breakfast and lunch when I work. 2. Write and/or edit my work every day. I always say that I’ll finish editing my book this year and finally start submitting queries. Then two weeks have gone by and I’ve done nothing but pass out on the couch after a Doctor Who or Supernatural marathon once I’ve put my daughter to bed. At least if I write and edit SOMETHING every day it will eventually come to fruition. People are waiting for the final entry to the Perry Series. 3. Be proud of my writing. I’m not one of those women who shoot down compliments. If you tell me how nice my shirt looks I just smile and say thanks. I don’t go on and on about how old it is or how I didn’t have time to iron it. But if you ask me about my writing, I’ll sometimes shy away and change the subject. I’m a freaking published writer. No more hiding it! My inner depressed person would say things like: when I lose weight I’ll feel more comfortable; when I’m a successful, published author I’ll be able to do the things I love; when I have a better job I’ll be happier. Have you ever heard anything so sad? Don’t get me wrong, I love my life and my family. But that sad person in me always tried to make me wait to be happy. No more of that. I am too blessed to wait to be happy. The sun shines when my daughter smiles and my husband’s laugh is like music. I’m pretty awesome too! 5. It can’t rain all the time. If we didn’t experience crappy things in our lives we wouldn’t enjoy the sunshine. But in the past year I’ve learned to find joy in the rain. The joy is always present just waiting to be discovered. My goals are clear in my mind and I have no doubt I’ll do all the things I set my mind and my heart to, but life doesn’t have to be put on hold until it happens. That lesson is second nature to a lot of people, but some of us have to work at it. Some years ago depression found me and hung around my neck like a noose for too long. I won’t let that happen again. The person I’ve grown into smiles and laughs even when there seems to be no way out. Because I know that there is always a way out. It comes. 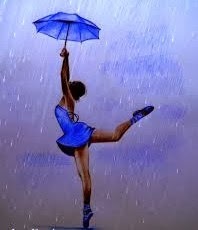 You just have to weather the storm and dance in the rain until it does. And even before the storm has passed, you’ve learned to let the rain nourish your soul so that when the sun does shine your blooming is inevitable. These are the lessons that I hold close to my heart and ever present in my mind. With them there is nothing that I can’t do. And I am so blessed to finally know this.